It’s been exciting to see the signs of spring in Southern California. In our 68 degree beach weather, the changes are far more subtle than in other parts of the country, but the night jasmine blooms, citrus blossoms scent the air, pops of color brighten garden planters. We see early harvest tomatoes and strawberries, asparagus and spring onions in the farmer’s markets. 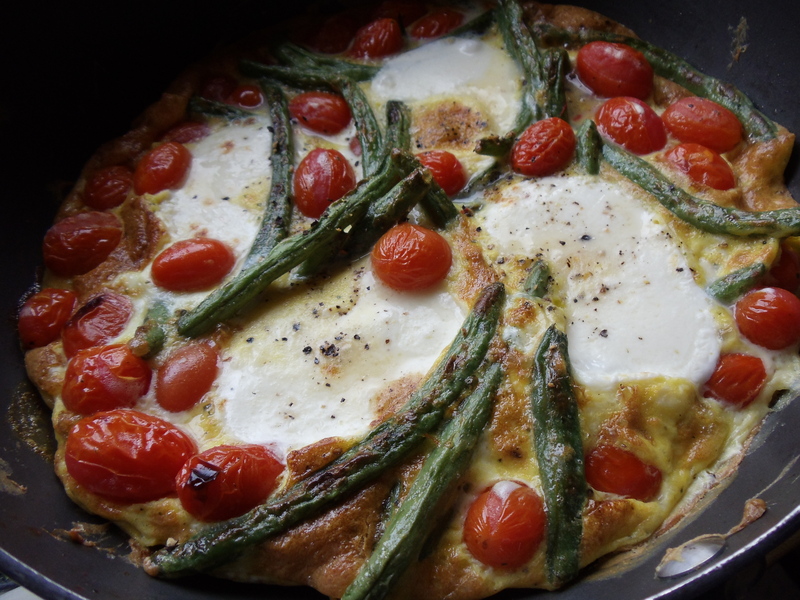 And we move from hearty stews and soups to lighter fare, like this quick and easy frittata. Directions: Heat the broiler on high heat. Heat a large skillet over medium high heat. Coat the bottom of the pan with a thin layer of olive oil, and add the asparagus, tomatoes and onions. Cook until the vegetables begin to brown, then add the garlic, and continue to cook for another 2 minutes while stirring. Season the vegetables with salt and pepper. Crack the eggs in a large bowl and season with salt and pepper. Pour the eggs over the vegetables into the skillet and mix together. Allow the eggs to set, then using a spatula, lift the edges of the cooked egg up and away from the sides, allowing the uncooked eggs to run under. Continue to cook until the eggs are almost set, then top the eggs with basil and cheese. Season with additional salt and pepper, then set under a broiler until the cheese is melted and the top of the frittata is golden brown. Remove from the oven and allow the cheese to set for about 5 minutes, then cut into wedges to serve.